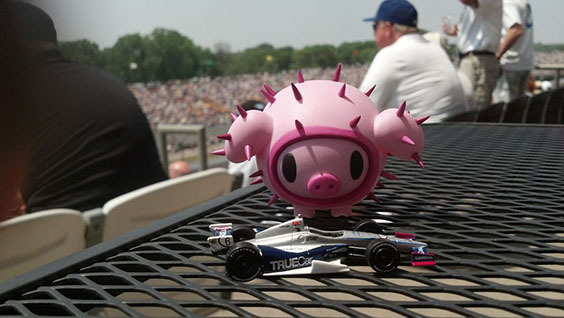 Our very own Porcino got the chance to hang out at the Indianapolis 500 over Memorial Day weekend with TrueCar rally driver Verena Mei! Porcino was incredibly excited to be able to attend, and luckily for us he took tons of pictures! Below, Verena and Porcino watch as cars whiz past on the track. They had wonderful seats with a great view of the race. Above, Porcino and Verena watch the race while paying their respects to Dan Wheldon, a former Indy 500 winner who died tragically last year. The white-rimmed glasses were all over the Indy 500 this year, as people silently paid tribute to the racing legend. 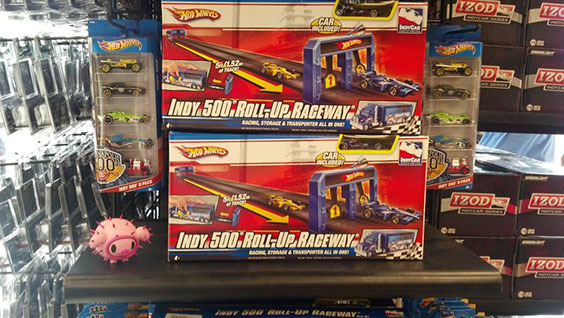 Porcino considered buying a car from HotWheels, but chose to wait and see if he could find something even better. He loved the treat of eating chocolate and pretzels, and they gave him plenty of energy for the rest of the day! He and Verena also got to kiss the ground at the Yard of Bricks, a famous Indy Motor Speedway landmark. The IMS track was originally all made of brick, and the Yard of Bricks is the only remaining brick part. It’s customary for winners to kiss the bricks after they win. Last, but not least, Porcino finally got a chance to try out his new car. He opted for a miniature version of Verena's teammate Katherine Legge's TrueCar rather than HotWheels, and we can’t convince him to stop driving it all over the place! 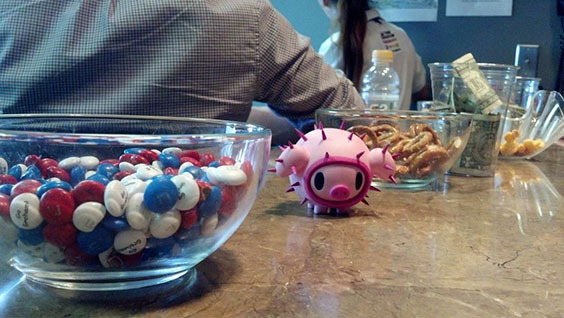 Thank you Verena, for bringing our little pink friend to the Indianapolis 500! He had a blast, and can’t wait to go on another rally with you!